If your driveway, sidewalk or patio has uneven surfaces due to sinking concrete, Northern Basement Systems has the solution you need. PolyLevel® is an alternative solution to traditional mud jacking that lifts concrete slabs to a level position and provides long lasting stabilization. Here are some examples showing the difference PolyLevel® can make for homeowners. Call us today at 1-855-248-5226 to get started with a free estimate in Burlington, Keene, Colchester and the nearby areas! Not sure who to call for concrete leveling or repair on your property? Northern Basement Systems is your local foundation repair contractor providing quality solutions for raising sunken concrete. We repair uneven concrete with our fast-curing and effective PolyLevel® injection foam. 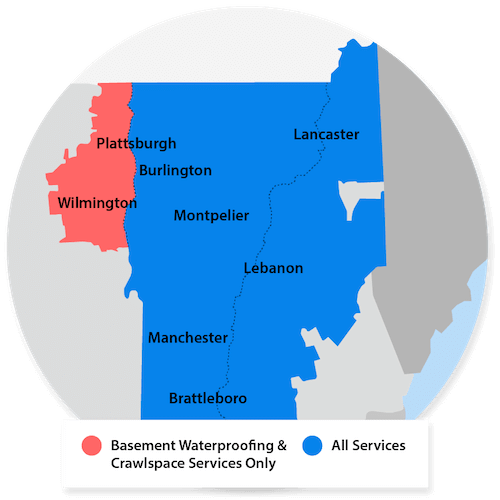 Contact us to schedule an free estimate for concrete repair using PolyLevel® in Burlington, Keene, Colchester, Rutland, Laconia, South Burlington, Bennington, Brattleboro, St Albans, Montpelier and the surrounding areas.